The sweet and tangy flavors of this deliciously different Rhubarb Crunch pair perfectly with a scoop of vanilla ice cream. Hello and happy Monday. I just got home last night from BYBC13 in Salt Lake City and I had so much fun! First of all I got to stay with my sister in law Natalie and spend time with her and my husbands youngest brother; they took me to some seriously yummy eats. Friday morning I just had to eat French Toast at Kneaders and then we had Red Iguana that night = amazing enchiladas. Saturday was conference day and oh what a day! I had a lot of fun networking and meeting other bloggers in person, something that doesn’t happen often, but I do love my online bloggy friends 🙂 I got to meet some really amazing women and even had a little geek out moment with Natalie when after the conference we had our picture taken with Maria of Two Peas and Their Pod and Amanda of Kevin and Amanda. It was pretty awesome! Now that I am home, I am getting back into the swing of normal life again; losing two hours in the air is always so hard. Today I am sharing a recipe that is near and dear to my heart; last month I was lucky enough to guest post for Jenny over at The Southern Institute, thanks again Jenny for being so sweet! Like many of you, I love to spending time with my family and I especially love sharing family recipes. For me there is just something so special about passing on a recipe my loved ones treasure, but most importantly the feeling that I have for said recipe. 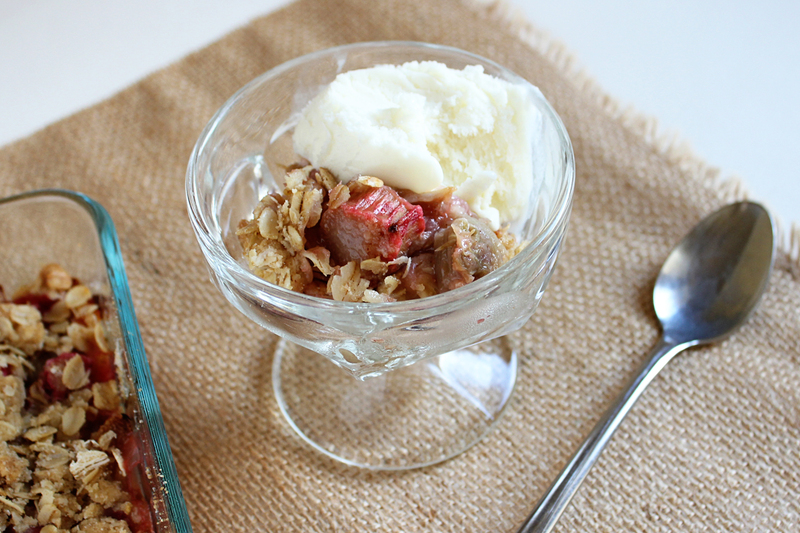 One of my absolute favorite recipes from my childhood is Rhubarb Crunch, a little odd I know. I have always loved the sweet and tangy flavors of this crisp, we usually ate it warm with a scoop of vanilla ice cream, but I have been known to eat it plain at breakfast. This crisp is one of the recipes that I can remember my mother making on Sunday evenings or for special occasions and she passed it on to me when I left for college. Incidentally we have both misplaced the original recipe and so this is my recreation of the family classic. Next time you are in the mood for a dessert a little out of the ordinary, check the freezer section of your local grocery store for some rhubarb (or if you’re lucky enough for it to be in season the produce department). I hope you’ll enjoy, happy baking! Preheat your oven to 375º and prepare a small baking dish (5"x7") with cooking spray; set aside. In a medium sized bowl add the rhubarb, flour, corn starch, sugar and cinnamon; toss to coat. Spread the rhubarb mixture evenly over the bottom of the baking pan and dot with the 1/2 Tbs butter. In a small bowl combine the oats, sugars and flour, cut in the butter with your fingers until the mixture is crumbly. Spread the topping mixture over the rhubarb and bake for 45 minutes - 1 hour, until bubbly and golden on top. Carefully remove from the oven to cool 8-10 minutes, serve warm. Yum! I love rhubarb! I couldn’t participate in that conference..maybe next year! I LOVE anything rhubarb! I usually wait till early spring when it is in season in upstate NY and then I can get it at roadside stands. I have tried a similar recipe and I also love it in Strawberry (also in season in the spring) Rhubarb pie. Every year I debate whether or not to get a rhubarb plant at the farmers market….they are known to get HUGE! Have you ever grown it? Hey I am just stopping in to say after grabbing your very cute card at BYB on Sat. That conference was great wasn’t it?! You take beautiful pictures-very nice blog and cute blog name! Oh thank God it’s almost Friday.. 🙂 and everything with rhubarb sounds so good to me, i love that sour taste! I love rhubarb and have some frozen. I need to make some of this. Thanks for sharing on Foodie Friends Friday and remember to come back and vote on Sunday. This looks brilliant! My mum loves rhubarb so this would make a great treat for her! Rhubarb sounds like a great crisp. Thanks for sharing at Foodie Friends Friday Linky Party.